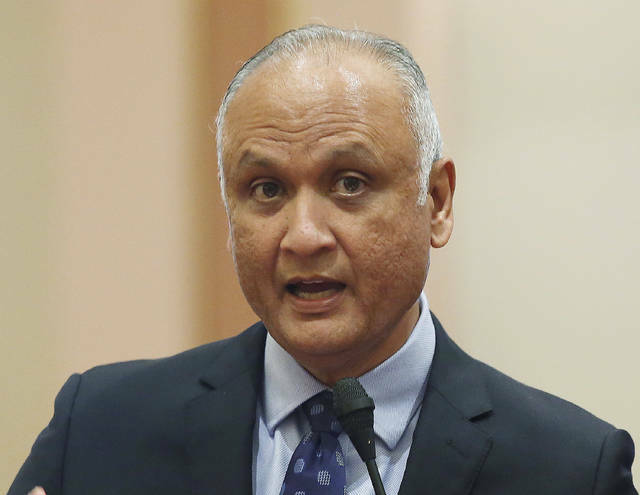 SACRAMENTO, Calif. (AP) — California Attorney General Xavier Becerra, Secretary of State Alex Padilla and Controller Betty Yee will all return to office. Eleni Kounalakis will be the first female lieutenant governor. The four are among several statewide offices voters cast ballots for Tuesday. In the contest for insurance commissioner, Republican-turned-independent Steve Poizner had the edge over Democratic Sen. Ricardo Lara. 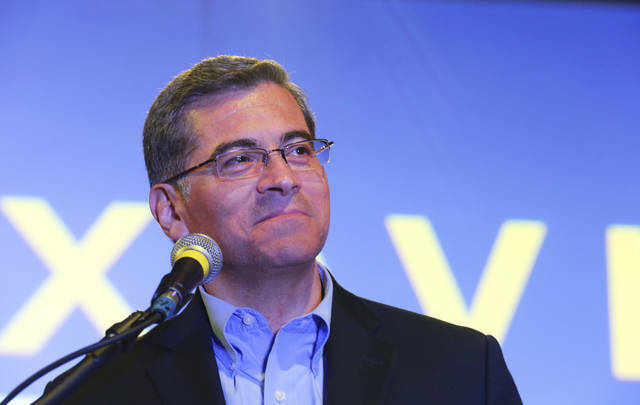 Xavier Becerra, who was appointed California’s first Latino attorney general last year after Kamala Harris left for the U.S. Senate, was elected to stay on the job. “I’m honored and elated by the voters’ confidence to continue as Attorney General of our great state,” he said. 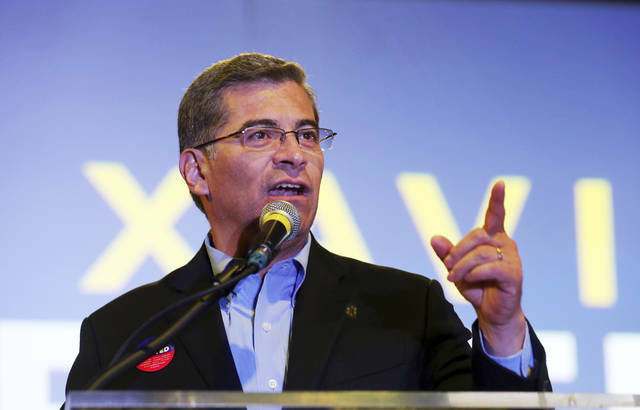 Becerra vowed to continue battling the Trump administration. Formerly a longtime Los Angeles congressman, Becerra regularly makes national headlines challenging the GOP president’s efforts to change environmental and immigration policies. Eleni Kounalakis will be California’s first female lieutenant governor after defeating Ed Hernandez in a Democrat-on-Democrat matchup. Although the job holds little real power, it’s seen as a launching pad to higher office. Kounalakis and Hernandez, a state senator, advanced after no Republican finished in the top two spots during June’s blanket primary. Both have promised not to take insurance money, though Lara had to give back money he took from the political action committee of the nation’s largest physician-owned medical malpractice insurer. California’s Democratic Secretary of State Alex Padilla was re-elected after campaigning on his record of sparring with President Donald Trump. Padilla often denounced the president’s unsubstantiated claims of widespread voter fraud in California. He also refused to comply with the Trump administration’s requests to provide data on California voters, arguing it was politically motivated. Meuser ran on a platform of purging voter rolls of people who have moved or died and conducting audits to ensure ineligible people aren’t registered to vote. Democrat Fiona Ma is the voters’ choice to replace outgoing Treasurer John Chiang. Ma, a State Board of Equalization member and former assemblywoman, vowed to build a “fiscal wall” against what she called harmful policies coming out of the White House. She said her experience as a certified public accountant will help keep the state’s fiscal house in order. The controller serves as the state’s top accountant and audits various state programs, and has seats on several state boards and the State Lands Commission. Los Angeles schools executive Marshall Tuck is leading with 52 percent of the vote as he vies to be the state’s top public education official. Thurmond has stressed opposing the Trump administration’s agenda, including proposals to transfer money from traditional public schools to charters. Thurmond and Tuck are Democrats, but the race is nonpartisan and their party affiliation won’t appear on the ballot. Late last year, on the eve of former director Richard Cordray’s departure, the Consumer Financial Protection Bureau released its “Payday, Vehicle Title, and Certain High-Cost Installment Loans Rule,” which, while styled as consumer protection, immediately created widespread confusion and uncertainty among businesses and consumers throughout the United States. Thankfully, the CFPB has announced it will revise this ill-considered and poorly constructed rule, a result that can’t come soon enough as businesses wait in regulatory limbo and consumers, who are already stressed, learn whether a valued financial service will remain available to them. Without a change to this harmful rule, hundreds of regulated businesses currently offering small loan products will be forced to close. A study conducted (and submitted to Cordray’s CFPB during the rulemaking process) of the effect of the rule established that virtually all of the businesses attempting to operate under its overly restrictive provisions would become unprofitable, a result that is merely reflective of the bureau’s own estimate that revenues would decrease by at least 75 percent and that the industry would suffer sever contraction. What’s worse will be the aftermath of these closings. Each of those shuttered stores will be forced to lay off their employees — leading to the loss of nearly 60,000 jobs nationwide. Many of the jobs belong to racial and ethnic minorities and are in communities where other jobs are scarce. The bureau, in an attempt to regulate away a critical financial product will in fact regulate away valuable jobs in America’s most vulnerable communities. Let’s also not forget the consumers. Each year, 15 million American households rely on small dollar loan products for credit, and the other products offered by the industry including providing a safe place for consumers to cash checks, pay bills, and transfer money. The industry processes 350 million transactions annually for underbanked and unbanked Americans. Where are they to turn when they no longer have access to a financial service center? Some might say a bank, but these consumers know that’s unlikely. Without a steady income or established credit history, or, as is more likely the case a poor credit history, these Americans will be turned away from traditional financial institutions and forced to turn to the unregulated black market. Thankfully, Cordray has moved on, and the new leadership of Mick Mulvaney has taken notice of the infirmities of this rule. The CFPB has now announced that it expects to issue proposed rules in January 2019 that will reconsider the bureau’s Small-Dollar Loan Rule, as well as address its compliance date. Specifically, the bureau has expressed its intention to revisit the ability-to-repay provisions of the rule, which will be the primary culprit in denying access to credit. This is no doubt a long-needed step in the right direction. The bureau plans to rightly re-evaluate this provision, which will have significant consequences for both industry and consumers if implemented in its current form. By the CFPB’s own assessment, the ability-to-repay provision itself, if left untouched, would be a major factor in drastically reducing revenues, eliminating profitability and decimating the industry. In addition to its intent to revisit the ability-to-repay provision, the CFPB also announced it will revisit the compliance date of the rule — and rightfully so. Both industry stakeholders and consumers have been in a state of limbo as businesses struggle with whether or not to incur costly compliance fees should the rule not actually go in effect, and with customers unsure as to whether or not these important forms of credit will exist come next year. Moreover, businesses are in the process now of making business plans regarding leases, investments in store locations and technology, hiring, and refinancing of debt. As it stands now, the compliance date of August 2019 draws near — and the CFPB’s announcement of a proposed rulemaking to reconsider the ability-to-repay provisions and the compliance date has the ability to assuage the fears of countless businesses, employees and consumers. Mulvaney and the CFPB have taken this process seriously — something for which the financial service center industry and I have been extremely grateful. Come January 2019, it’s vital the CFPB’s proposed rules address the very real concerns of businesses and consumers alike. The time has come to put a stop to the former bureau’s overregulation. I look forward to working with the CFPB staff to ensure Americans have access to the critical forms of credit short-term lenders provide for years to come. Ed D’Alessio is the executive director of the Financial Service Centers of America. He wrote this for InsideSources.com. —Presidential Harassment and Agency Hounding. Americans voted for a divided government perhaps in hopes of forcing Congress to work together. After the shootings of Republicans and delivery of potentially harmful mail bombs to Democratic leaders, there was hope that national unity could override partisan rancor. But those violent episodes could not overcome the political divide, and this new Congress likely won’t either. The Nov. 6 election results will launch America into completely unchartered territory. What has happened in the two years of President Donald Trump’s presidency, a period with no historic precedent, will inform what comes next, but the next two years will be wildly different than the previous two. One key feature of the next phase in our political life will be disappointingly dull. But we will also face fundamental threats to our democracy and opportunities to move toward the kinds of transformational change desired by an overwhelming majority of Americans. First, Americans should not expect many bills to be approved by Congress and signed by the president. In his post-election news conference, Trump sketched a scenario where he could negotiate deals with the Democratic leadership in the U.S. House of Representatives, move the bills over to the U.S. Senate to be passed with Democratic and some Republican support, and sign them into law. He talked about infrastructure and drug pricing as areas where such deals could be struck. Trump was entirely right in saying that these scenarios could occur. But there is absolutely no reason to expect he aims to negotiate. For one thing, Trump said Democrats would have to choose between performing their constitutional oversight duties — their basic check-and-balance function — or cutting deals. The Democrats shouldn’t, can’t and won’t agree to abandon their oversight obligations. For another, working out these deals would require Trump to sideline the corporate lobbyists, lawyers and executives in his own administration — the people who are making policy in the administration and who have shown themselves far more interested in protecting their former employers than serving the broad public interest. Second, Americans should be vigilant about ever-greater abuses of power from Trump. It’s apparent that one lesson he took from the election is that he maximizes his political power when he plays to his worst racist, anti-immigrant and authoritarian tendencies. That’s one reason it’s so important to respond to the firing of Attorney General Jeff Sessions and ensure that Special Counsel Robert Mueller’s investigation is protected. It’s not only about holding accountable anyone who sought to subvert our elections in 2016. It’s about defending the bedrock principle that nobody is above the law, and containing the autocratic inclinations of the most powerful person on the planet. Third, House Democrats will engage in probing investigative and oversight hearings. If they do their job right, they won’t seek to create “gotcha moments” for the TV cameras. Instead, they will probe and uncover the abuses of the Trump administration: the abuses of power; Trump’s personal conflicts of interest and how they affect policy; and, most fundamentally, the corporate corruption that pervades the administration. The policies resulting from the corporate takeover are killing and injuring people, and stealing from their wallets, through regulatory rollbacks, failure to enforce safeguards, slashed programs, corporate giveaways and more. For all we already know, deliberate investigations will reveal depths of corruption and wrongdoing beyond our imagination. Finally, increasingly powerful grassroots movements are going to demand that House Democrats debate and legislate to respond to the aggressive, progressive agenda that Americans of all political stripes favor. More than 90 percent of Americans want fundamental campaign finance reform. The House will consider and likely approve the most sweeping pro-democracy, anti-corruption legislation in 50 years. Americans ranked health care as their top issue in Election Day exit polls. Voters are absolutely terrified of Republican proposals to enable insurers to deny coverage to people with pre-existing conditions. But they are not asking for preservation of the status quo; they want bold changes. An increasingly strong movement will force every member of Congress to take a position on Medicare-for-All, the best way to expand coverage to everyone while reducing the waste and pricing abuses of the health insurance, pharmaceutical and for-profit hospital corporations. Some very progressive bills will pass the House. Others may fail to garner a majority. Either way, they are not likely to become law with Trump as president. But they will make clear to the American people that solutions — real solutions, not the demagoguery of Trump — are at hand for the real problems and the legitimate grievances that are widely felt in America. We don’t have to have a rigged political system. We don’t have to accept the rationing of health care based on ability to pay. There’s no reason to tolerate historic levels of wealth and income inequality. These are things for Americans to unify around, and it is hoped we will.